Since my last post I’ve been experimenting with using the Commodore 64’s multi-color character mode. 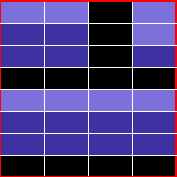 This mode allows you to display 4 different colours in each 8×8 pixel character cell but with the loss of horizontal resolution. 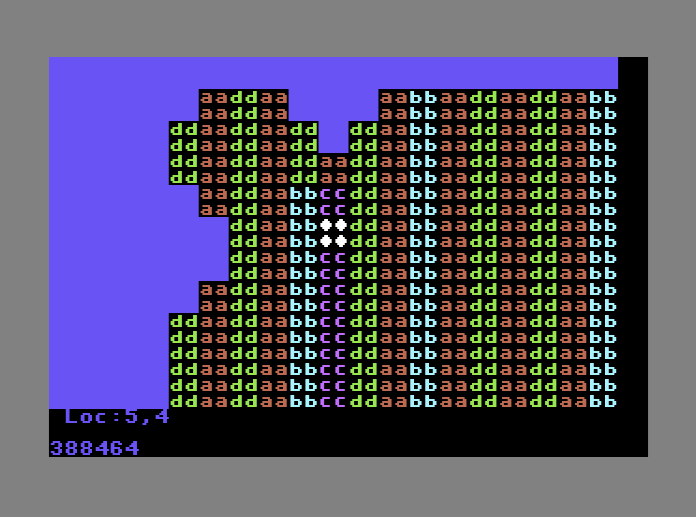 Each “pixel” in multi-color mode is effectively made up of 2 horizontal pixels – this sometimes leads to the slightly “chunky” look of some C64 graphics in games. 1 colour is the background, 2 colours are set universally for each character using registers and the other comes from the C64’s screen colour RAM (one colour per character cell on screen). It’s possible to use a mixture of multi-color mode characters with standard high-res characters on a single screen. This is done by setting bit 3 of each character cell’s color memory – the value of this bit determines whether a character on the screen is in standard high-res mode or multi-color mode. The downside of this is that you have a more limited selection of colours. Colour values of 0-7 in the colour RAM will display a high res character, 8-15 a multi-color mode character. This means you can’t use colours 8-15 in your display other than as one of the 3 universal colours – so no light red, shades of gray, light green etc (colours on the right hand side below). I’ve done a bit of experimentation with Pixcen and produced a few sample multi-color tiles but it took me a while to understand how the colour limitations work and I find the loss of horizontal resolution hard to work with, and I have little artistic skill to start with! I also need to work out what my graphics development process is. Pixcen seems to be a good enough utility but I think there may be other tools which might suit me better. 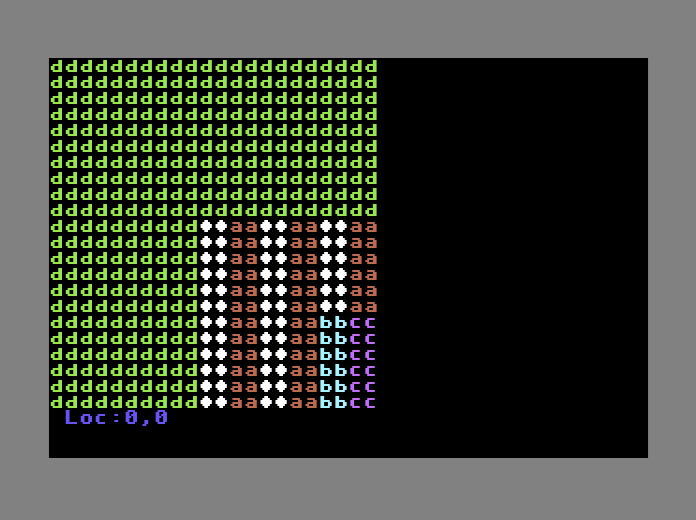 Some form of C64 graphic, tile and map editor might be required. So I have a real balancing act to consider, deciding on whether to use multi-color mode (losing resolution and colour choice) or just stick to using high-res characters but having the limitation of a single colour per cell. I’m aware that I could use one of the C64’s bitmap modes which provides the programmer with control of individual on-screen pixels with greater colour flexibility but from what I’ve read that will use a lot of memory (8K just for the bitmap data) and would potentially be slower than using characters. Let me know your thoughts. 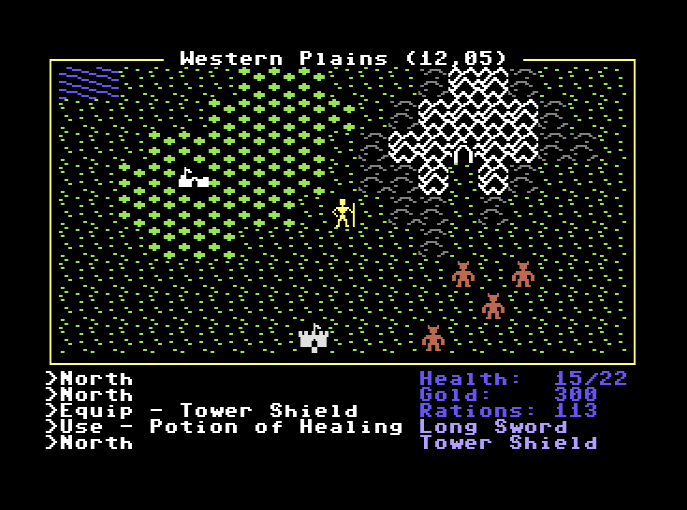 Here’s the latest image from my Commodore 64 RPG. I’ve added some additional tiles (from Ultima IV) as placeholders and to give me something to work with whilst coding game functionality. The Ultima IV tiles and C64 character set are temporary. I now need to add some additional maps to the game with working entrances and exits, initially just a town and a dungeon. I need to give some serious thought to map sizes and how I want to manage the wilderness map. Games such as Ultima IV and V would load sections of their wilderness map into memory as required but I’m not sure my map needs to be as large. I’d also like to add some basic combat with those red monsters on the wilderness map and some basic interaction with some example town NPCs. I’ve spent a bit of time looking at Windows based tools to enable me to easily put some new graphics into the C64 game. 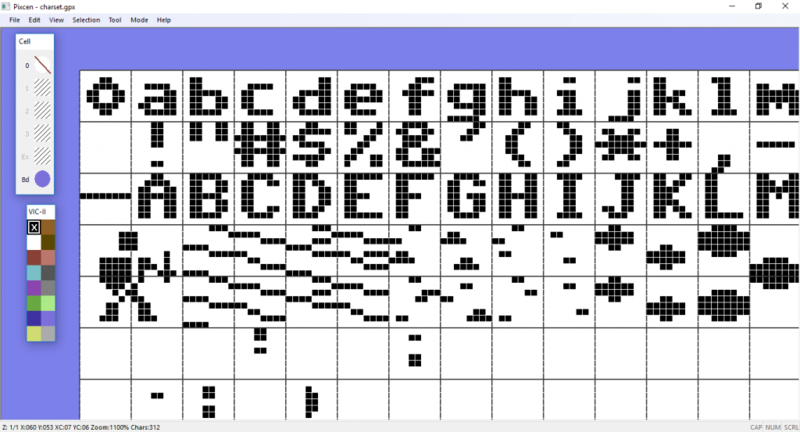 Previously I was exporting a simple binary file from the character editor in CBM PRG Studio which works ok but isn’t really geared towards larger bitmap graphics than tiles or sprites. A few of them were ok but for now I’m going to use Pixcen. I’ve added a few Ultima style tiles just to get a better idea of the display in use. These are just placeholders so I can hopefully spent a bit of time working on a more original look for my CRPG. Since my last post I’ve made some fairly significant changes to the on screen map display for my C64 CRPG. Firstly I’ve changed the display from a full screen map to a window onto the map. In addition I’ve changed the code to display each map tile using 4 characters rather than a single one. An Ultima style view of the larger map. The green areas represent “off map” areas. Ignoring my example “tiles” above which are using characters to get the initial map and tile code working correctly, this is working very well for my initial attempt. Once I had this working I expanded the view. Here’s a slightly modified version with a simple “water” type tile and a highlight to represent a player tile. I’m finding that my code changes are coming along nicely now that I’m using C code again so that’s been a very positive change without the performance drop that I was concerned about. Despite appearances the characters that make up the display are set up to be easily replaced with redefined characters. I’ll put some simple tiles in just to provide a better idea of how the display with look. I’m very pleased with how quickly some of these changes are coming along which has surprised me a lot.